Review: A biopic about the relationship between author A.A. Milne and his son C.R. Milne. and the creation of the Winnie the Pooh stories. The story shows how the books bought hope and comfort to England after the First World War. As this book was such an international success it came at a cost to the author, his young son and his wife Daphne. I have to say that I have never really been a Winnie the Pooh fanatical fan. The two performances that stood out for me were Kelly Macdonald who has gone from strength to strength in her career and also Will Tilston who plays the young Christopher Robin. I found him a delight to watch. It was lovely to see Kelly Macdonald and she was perfect for this role. 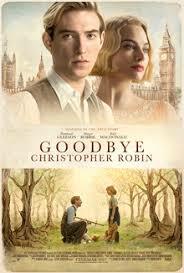 It came across in this that Christopher Robin was more close to his nanny than his own mum. I did think that Margot Robbie was a weak link and there were a few scenes of her which I thought were a bit embarrassing. Maybe this was just a too big a role for her and she couldn’t quite fill her full potential. What does come across with Domhnall Gleeson’s character is the post traumatic stress of the war. With this is does show what the war was like. In some other films they have war scenes in but they are not at all realistic. In this film the reality of life in the trenches is bought to life very well. This is the second time that Domhnall Gleeson and Margot Robbie have starred in together, the other one was About Time, 2013. This is the third film that Domhnall Gleeson and Kelly Macdonald have both starred in. The first being Harry Potter and the Deathly Hallows: Part 2, 2011 and also Anna Karenina, 2012. The script was very well written. It is a lovely charming film. At the end of this film I actually shed a tear I found it all so moving.